Teach programming, Unity and C# in a visual way. Bolt is a fantastic learning tool. With live editing and visual feedback, your students can literally see the flow of logic as it happens. It's a powerful and fun way to learn core programming skills in an industry-standard environment. If you are an educator, reach out to us and we can provide you with an evaluation copy. You're still teaching C#... but visually. Beyond Bolt, students learn core C# and Unity skills, the industry-leading tools in game devevelopment. 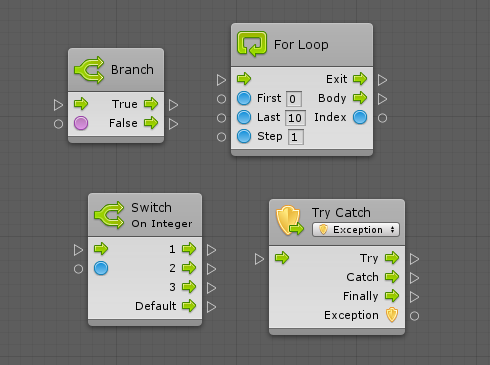 Branch, switch, select, loop: every core C# control structure is available for use in Bolt with the same pattern and parameters. 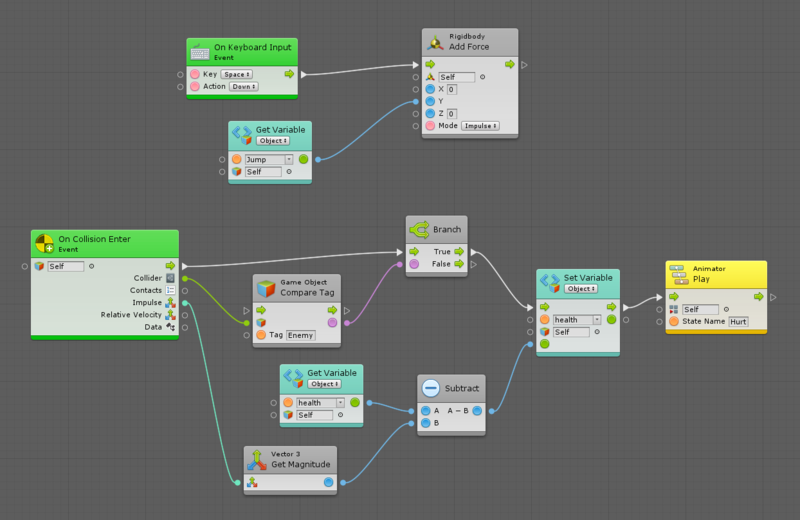 Bolt simplifies variables with 6 simple scopes: flow, graph, object, scene, application and saved. Spend time teaching logic, not data storage. Every primitive, class and struct is available in Bolt, with a clear color-coding pattern that helps students match ports and understand type compatibility. Live editing lets your students experiment and see the results instantly. Every graph can be modified during play mode, allowing you to quickly showcase the effect of changes. With our ever-expanding Learning Hub, you and your students have all the resources they need. Every notion is covered, from core C# concepts like types and variables to Bolt notions like graphs and macros. Video and text guides that guide you through the creation of entire games and specific mechanics. Edit your graph and see the C# code side-by-side, instantly. Every week, our users are telling us how Bolt helped them understand programming. It's still programming but visual, context-sensitive and with instant feedback. I'm basically learning C# and Bolt at the same time. Bolt has enabled me to learn how to code. And for that I'm grateful. 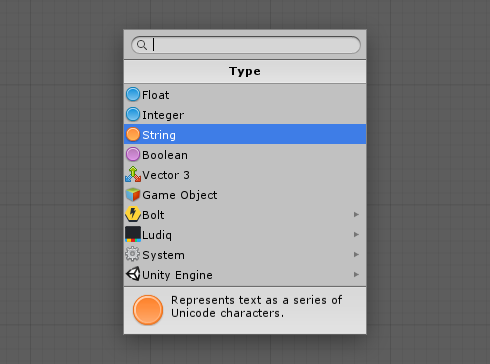 The unexpected side-effect of Bolt is that I am now able to read the C# code, follow Unity C# tutorials and implement the solutions with Bolt. The ability to visualise the logic of the game in real time as it is running is so satisfying. If you are new to coding (or just C#) this is, in my opinion, the best VS tool to learn to code with right now. 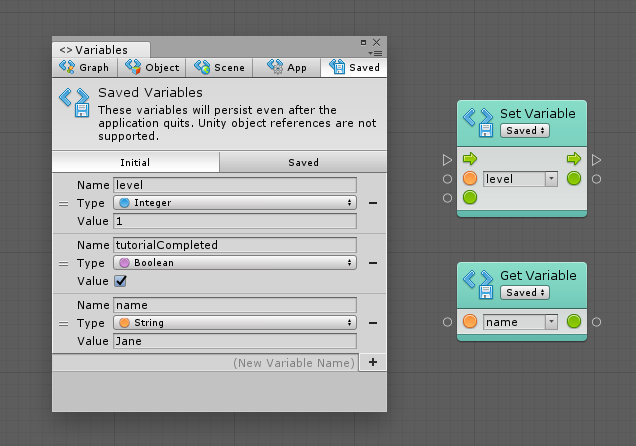 Visual scripting feels like it's going to be main programming interface in the future. Programming becomes more accessible for everyone with tools like this. We're preparing a C# fundamentals course outline taught using Bolt.